Invite a child to come by telling them you have something to show them. Have the child bring the appropriate dressing frame and have them place it on a specific spot on the table you will be working at. Have the child sit down first, and then you sit down to the child’s right. Tell the child that you will be showing him how unzip and zip. Give the names of each part. 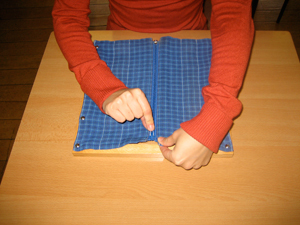 Place your right thumb under the zipper handle and place your right index finger over to pinch fingers together. 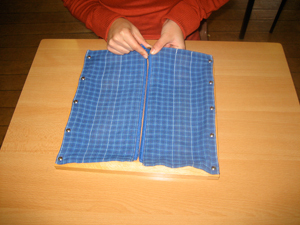 Pinch (material) the top part to the right of the zipper teeth with your left thumb and index finger. Slowly and in a continuous movement, pull the zipper handle down. Slow down when you get to the bottom to emphasis when the pin slides out. Make sure the pin comes out of the pin holder. Pinch the zipper handle with your right thumb and index finger. Make a point of showing that the handle needs to point down. Place your right index finger on the top part of the tab and your right thumb at the bottom of the tab. Pinch the bottom part to the right of the zipper teeth with your left thumb and index finger. Slide the pin slowly into the tab. Make sure the tab slides fully in. Repinch the zipper handle with your right thumb and index. 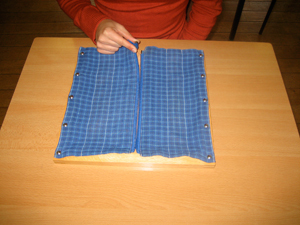 Pull the material taught with your left hand. Slide the handle up until your reach the top. Lower the handle so it is lying downwards and remove fingers. Once done, offer the child the opportunity to unzip and zip. Direct: To help them learn how to zip themselves. You may want to ask the child where he has seen a zipper before to have him associate what he is about to do to his every day clothing. 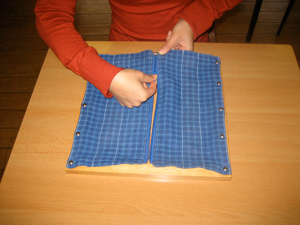 This Montessori Video shows how to present a child with the Dressing Frame - Zipper.